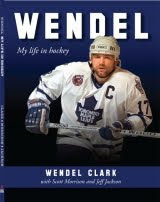 The first book of 2010-11 hockey season appears to be Wendel Clark's book Wendel: My Life In Hockey. The book is published by Jackson Events, which is a handling service for celebrities, namely hockey players. It is available at Chapters but not Amazon so far. I am trying to get a review copy. In the mean time, be sure to read Mike Zeisberger's Toronto Sun article about the book. Also be sure to check out WendelClark.ca and his Facebook and Twitter feeds for more information on the book and sales locations.